Ca' Rezzonico, in the Dorsoduro district, is one of the grandest palaces on the Grand Canal, dating in part from the seventeenth and in part from the eighteenth century. Since 1934 it has belonged to the City of Venice, and it houses the Museo del Settecento Veneziano, the Museum of Eighteenth-Century Venice. The fine rooms, some with ceilings frescoed by Tiepolo, are ornamented with a collections of eighteenth-century furniture and art. It's not an essential tourist attraction for your first, short trip to Venice, but if you have the time and inclination for getting to know the town better, it's a fascinating place. Unless the Art Biennale is on, this may be your only chance to view the interior of a Grand Canal palazzo. 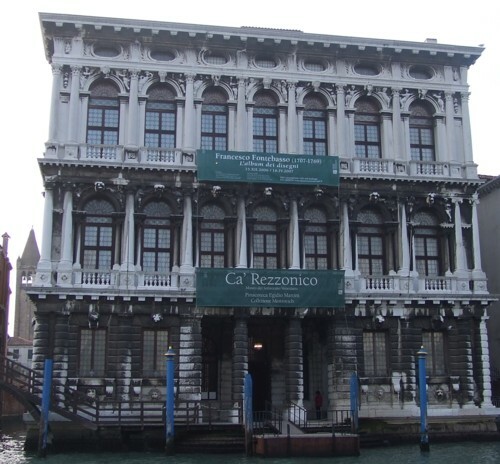 Ca' Rezzonico was the last home of the poet Robert Browning. In 1888 his son Pen Barrett Browning (who'd married an American heiress) bought the palazzo, and Browning spent his last months living in a mezzanine apartment off the courtyard. The poet died here on 12 December 1889, in this suite of rooms which now houses the Mestrovich Collection. Sadly, visitors can only access the two rooms used for the exhibition, and there is no trace of Browning within. 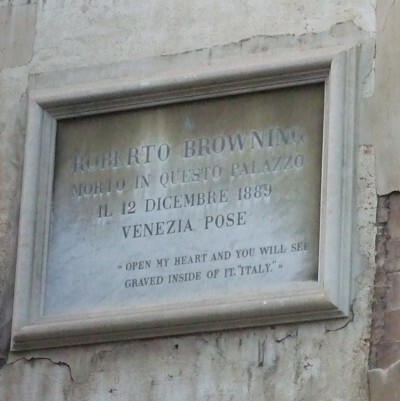 Outside, however, from the Ca' Rezzonico vaporetto stop, you can see a stone plaque on the wall of the building which remembers the poet 'Roberto Browning' and quotes his lines: Open my heart and you will see / Graved inside of it, 'Italy'. The main land entrance (more below about getting there) is marked by an imposing gateway, ornate architectural details and a basin containing large goldfish. To one side is a garden with benches which is free to enter. The ground floor courtyard and androne (an entrance hall typical of Venetian buildings) lead through to the water entrance on the Grand Canal. On display inside is an old-fashioned gondola, with an enclosed cabin. Having bought your ticket, head upstairs to begin your tour of the building. A route is signposted, with information sheets in each room (in English). The tour begins in a glamorous ballroom, and continues through a series of formal reception rooms, several with their original ceiling frescoes by Giambattista Tiepolo. The rooms are furnished with the museum's collection of art and furniture, some of it quite overpoweringly Baroque. The next floor is used to display more art, including works by Canaletto (quite rare in Venice), some lovely Venetian vignettes by Pietro Longhi and two large Venetian scenes by Francesco Guardi, one showing nuns being visited by their families, the other portraying gamblers at the Ridotto. Perhaps the most striking exhibit on this floor, however, is a series of small rooms created to display the frescoes removed from the Tiepolo family villa on the mainland, the Villa Zianigo. The villa was decorated by Giambattista Tiepolo's son Giandomenico over many years. His paintings include mythical scenes, sweet illustrations of birds, sketches of elegant country life and images of Pulcinella (Punchinello), the Italian original of Mr Punch. One large scene, called the New World, shows, from behind, a large crowd gathered to see a marvellous magic lantern show. The third floor of the museum is an art gallery containing works collected in the twentieth century by Egidio Martini. Works date to all periods from the fifteenth century onwards, and include famous artists like Jacopo Tintoretto and Rosalba Carriera as well as many lesser-known Venetian artists. Towards the end of the chronological exhibition is an unexpected sight: an eighteenth-century pharmacy complete with wooden panelling and furniture, and china jars for medicines. Returning to the ground floor androne, a short flight of steps leads up the apartment where Browning lived and died. Two rooms of this apartment are now used to display the Mestrovich Collection, which includes paintings by Vittore Carpaccio's son Benedetto, by Cima da Conegliano, by Tintoretto and a glamorous Madonna by Francesco Guardi. There is theoretically a waterfront entrance accessible over a bridge from the Ca' Rezzonico vaporetto stop, but at the time of writing this little bridge is closed. You should take the only lane possible, which heads alongside San Barnaba church, cross in front of the church, take the bridge over a little canal and turn right. A joint ticket with all the other civic museums (Musei Civici) costs €18 (€12 concessions). A single ticket to Ca' Rezzonico costs €6.50 (€4.50 concessions). The museum is open 10am-5pm (6pm in summer) and is closed on Tuesdays. The ticket office closes an hour before the museum shuts.